In February 2013, Jane Macdonald of England, contacted me about the genealogical work done in the late 1890's by her great grandfather, John Hainsworth Simpson. We call him JHS for short. My wife's grandmother was a Simpson from the same line and village and probably knew JHS growing up. JHS had constructed a lineage from the 1660's of the Simpson family in Idle, a village near Bradford in West Yorkshire. His wonderful work has formed the basis of what is presented here and it is a pleasure to honour him in this small way. Thanks to Jane Macdonald for her willingness to share this material. 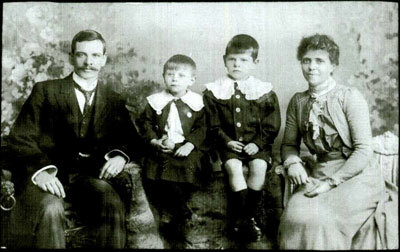 Photo taken about 1903: John H. Simpson, sons John Cecil and William George with his wife Mary Jane Lane. JHS lived his whole life in the village of Idle, now a suburb of Bradford, Yorkshire. Jane writes that, "He was by all accounts a remarkable man, a master painter and decorator during the summer - when the oil-based paints would dry - and an iron-monger by trade through the winter months. During his lifetime, he amassed a huge collection of antiquities, created the renowned Chinese Garden in Idle and found time to research his family history back to the 1660s - surely a man more than a century ahead of his time!" In the early 1900's JHS was Sunday School Superintendent of St John's Mission Church and School in Idle. He had first attended this same church school as a scholar, a quarter of a century earlier in 1877. He lived for a number of years in Thorp Cottage and later at Faultice Cottage with his books and treasured collection. The community obviously thought highly of John as evidenced by the three newspaper articles accessible on the left below. 1905: "The Genealogy of the Simpsons of Idle." Chart by JHS. 1931: A House and Garden of Wonders from the Yorkshire Observer and Budget. 1959: Treasures in an Idle Home from the Bradford Telegraph and Argus. 1962: 66 Years of Collecting Antiques from the Shipley Times and Express. Drawing by JHS of an unidentified church interior. Perhaps someone can identify the church in the drawing or perhaps it is just a sampler of what JHS could do. On Good Friday, 1877, when JHS was 3 years old, his father, William Simpson died in a quarrying accident at age 27 and left a wife and four young children. His mother, Annie Hainsworth, remarried twice and there were 3 more children added to the family. For some reason, in his twenties, JHS became very interested his Simpson roots and their part in the history of Idle village. The Simpsons had been land owners as early as the 1600's and Simpson Green is still a local designation for a part of Idle. Calverley Parish included Idle and JHS was given access to the parish registers and also the later Idle registers. He went through them line by line and recorded all the birth, marriage and death entries for Simpsons of Idle. His notes have survived. He also recorded cemetery inscriptions from both Calverley and Idle. As well, it is clear that he found wills dating back to the 17th C and used these to help reconstruct family groupings. He would have asked Simpson elders alive in the 1890's what they knew of the family from the past. His work is valuable because of his contact with elders and the recording of now lost headstones and how this informed his family groupings; something that is much harder at the present. It is evident from his notes that JHS identified groupings of parents and their children and prepared his final version on a large chart - see the top link on the left. The chart is not dated but the year can be determined by the later addition of his children born after 1905. Jane Macdonald and I have found most, but not all, of the register entries on Ancestry.com and closely reviewed his notes, the chart and some new evidence and constructed our own version of the Simpson family. It differs little from that of JHS and where it does we have made comment to the change. This can be seen on the associated web page, the Simpson Family, Idle, Calverley Parish. JHS had a friendship with the Joseph Horsfall Turner, a noted antiquarian who also lived in Idle.